Parking meter regulations will be enforced on Monday, Nov. 12. All recreation facilities are closed on Sunday, Nov. 11. Recreation Facilities will be open on Monday, Nov. 12 for regularly scheduled programs except for preschool and after school. Humane Services Animal Care and Adoption Centre is closed on Sunday. City Council meeting for Monday, Nov. 12, will take place at 4:30 p.m. on Tuesday, Nov. 13. The Robin Hood Bay Waste Management Facility is closed* on Monday. There is no waste collection on Monday, Nov. 12. Garbage and recycling collection in all areas occurs the day after regular pick up day – including a Saturday pick up for area 5. See chart. The Access St. John’s Call Centre is available to residents 24/7 by calling 311 or 709-754-CITY (2489) or online at www.stjohns.ca/access-311. The Royal Canadian Legion Newfoundland and Labrador Remembrance Day Parade and Ceremony will take place Sunday, Nov. 11 beginning at the Sergeants’ Memorial, Queen’s Road at 10:10 a.m. 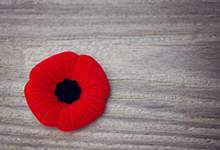 The parade will arrive at the National War Memorial at approximately 10:45 a.m. For more information about the ceremony please contact Provincial Command 753-1054. The Royal Canadian Legion is holding a special event at sunset on Sunday, Nov. 11, called ‘Bells of Peace’. The event begins with a short ceremony at 3:45 p.m. at the National War Memorial and concludes with the ringing of one hundred bells at sunset. More information can be found online. Road closures and parking restrictions to facilitate Remembrance Day events are posted under Traffic Advisories. *original release incorrectly indicated the Robin Hood Bay Waste Management Facility was open on Monday, but it is closed.